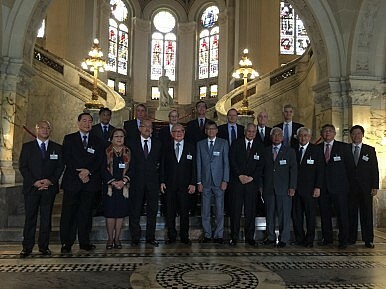 The Philippine team at the Peace Palace in The Hague, Netherlands, before the start of the oral arguments in connection with the arbitration case against China on the dispute in the South China Sea. In the Philippines' South China Sea Case, Is International Law on Trial? The Philippines and China have conflicting opinions on the symbolism of the case itself. Today marked the end of the first oral arguments in the Philippines’ arbitration case regarding Chinese actions in the South China Sea. From July 7 -13 ,the Permanent Court of Arbitration in The Hague held a hearing on the question of jurisdiction, a response to China’s claims (expressed obliquely, in a publicly-released position paper) that the arbitral tribunal has no jurisdiction to resolve the case, as it cannot judge on issues of sovereignty. The tribunal expects to make a decision on the issue of jurisdiction by the end of the year. If it dismisses concerns about jurisdiction, the tribunal will only then begin to hear the meat of the Philippines’ argument regarding the validity of China’s nine-dash line and the question of the status of certain maritime features in the South China Sea. Though this hearing was nominally limited to the question of jurisdiction, statements from the Philippines went beyond that narrow scope to get at the meaning of the case as a whole. As one might expect, Manila and Beijing have opposing views on the purpose and utility of arbitration, and that opposition sets them up for a showdown when the court makes its final decision. Manila claims that this arbitration is a test case for the utility of international law itself. In a statement made before the Permanent Court of Arbitration, Philippine Foreign Secretary Albert del Rosario sought to answer the question of why the Philippines brought the case. Del Rosario argued that the case is important not only for the Philippines, but for “the rule of law in international relations” in general, particularly as pertains to the UN Convention on the Law of the Sea. It is the dispute resolution mechanisms provided for in UNCLOS, del Rosario said, “that allow the weak to challenge the powerful on an equal footing, confident in the conviction that principles trump power; that law triumphs over force; and that right prevails over might.” According to that argument, if the dispute resolution process – in this case, the resort to independent arbitration – fails, it is tantamount to a win for those who argue “might is right” in international relations. It’s no wonder, then, that del Rosario’s statement invoked a constant refrain of China using “overwhelming force” in the South China Sea, which “the Philippines can only counter by invoking international law.” China’s stance and actions have become “progressively more aggressive and disconcerting,” del Rosario said, creating a “need for judicial intervention.” Del Rosario particularly noted China’s forcible expulsion of Filipino fisherman from the Scarborough Shoal in 2012 and land reclamation activities in 2014 and 2015. As a sign of the importance Manila attaches to the case, some of its top officials – del Rosario, the secretary of justice, and the secretary of national defense, plus lawmakers and ambassadors – were present at the oral arguments. China, meanwhile, did not send any representatives to participate or observe in the hearing. China’s lack of participation is part of its strategy to try and deny the legitimacy of the arbitration case. While Manila sees its case as a test for international law, China dismisses it as a blatant grab for territory. A June op-ed in Xinhua accused Manila of “hyping the tale of a bullying China” to gain sympathy “from those who are not familiar with the real situation.” “By negating China’s territorial sovereignty and maritime rights and interests in the South China Sea, the Philippines attempts to attain more illegal interests for itself and force China to make [a] compromise,” Foreign Ministry spokesperson Hua Chunying said in a July 2 press conference. China also argues that the Philippines’ arbitration case is itself a violation of previous agreements reached both bilaterally and multilaterally. The case “violates the consensus that has been repeatedly reached with China and violates the promise made in the Declaration on the Code of Conduct on the South China Sea,” Hua said last Tuesday, repeating points made many times before. And in any event, China has pointed out that it is legally entitled to refuse to participate in the arbitration and to ignore any judgment that results from it. China “would not accept and would not engage in the arbitration case that was unilaterally brought up by the Philippines,” Hua added. This brings the two sides to an impasse. On one side, Manila argues that China’s belligerence and intransigence has left it no recourse other than international arbitration – and if that fails, the Philippines suggests, it’s nothing less than the failure of the law-based international system. Beijing, meanwhile, has sworn that it will not change its policies or position in the South China Sea, regardless of international pressure (including a potentially unfavorable ruling from the tribunal). I’ve already covered this basic publicity war, where the Philippines and China both seek to sway international opinion to their favor using media coverage and carefully timed official statements. This time, however, the judgment will come not in the ‘court’ of public opinion, but the Permanent Court of Arbitration. Does the Philippines’ South China Sea Case Against China Really Matter? Arguments Open in Philippine Case Against China's South China Sea ClaimsInternational Law Is the Real Threat to China's South China Sea ClaimsHas the Philippines Forgotten its South China Sea Strategy?South China Sea: A Chinese 'Invasion' Near the Philippines' Pag-asa Island in the Spratlys?